One of the increasingly important requirements for high technology materials is that they possess near-surface properties different to their bulk properties. Specific surface properties are generally achieved through the use of these films or coatings or by modifying the structure or composition of the near surface. 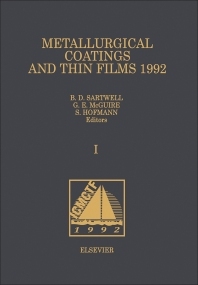 This two-volume work contains 157 papers covering a wide range of topics involving films, coatings, and modified surfaces. All aspects of the development of deposition technologies are addressed including basic research, applied research, applications development and full scale industrial production. The work will be of interest to materials scientists, physicists, electronic, chemical and mechanical engineers, and chemists. Abbreviated. VOLUME I. Coatings for Use at High Temperatures. Coatings to resist high-temperature corrosion (4 papers). Coatings to resist wear at high temperatures (3 papers). Thermal barrier coatings (5 papers). Coatings for composites used at high temperature (1 paper). Coatings for use at high temperatures (poster session) (one paper). Hard Coatings and Vapor Deposition Technology. PVD technology I: Plasma and magnetic field characterizations (2 papers). PVD technology II: Material and corrosion properties (3 papers). PVD technology III: Sputter, arc, and hybrid methods (5 papers). PVD technology IV: Residual stress and metal cutting (4 papers). CVD technology I: Hard coatings (4 papers). CVD technology II: OMCVD and fluidized bed CVD (6 papers). PVD technology V: Multilayer and multicomponent coatings (7 papers). PVD technology VI: Alternative approaches (5 papers). PVD technology VII: Metallic films (3 papers). Hard coatings and vapor deposition technology (poster session) (5 papers). Diamond and Related Materials. Synthesis, characterization and applications of cubic boron nitride (2 papers). Synthesis and characterization of diamond and related materials (5 papers). Scale-up and industrial applications of diamond and related materials (4 papers). Diamond and related materials (poster session) (2 papers). Tribological Coatings/Surface Modifications. Reduction of friction through coatings/surface modifications (5 papers). Wear resistance of ceramic, metallic, and composite coatings (12 papers). Coating resistance to erosion, corrosion, and severe environments (4 papers). Analysis, modeling, and micromechanical testing of tribological coatings (2 papers). Tribological properties of diamond, diamond-like, and c-BN coatings (3 papers). Tribological coatings/surface modifications (poster session) (1 paper). Optical Films and High Throughput Processing. Novel deposition process (1 paper). Manufacturing Processes and Equipment Applications. Surface modification methods (1 paper). Applications (3 papers). Author index. Subject index. VOLUME II. Thin Films for Microelectronics. VLSI devices: deposition, processing, and properties (4 papers). Metals for interconnects (1 paper). Sensors (1 paper). Deposition techniques (11 papers). Thin films for microelectronics (poster session) (3 papers). Diamond and Related Materials. Electronic and optical applications of diamond and related materials (2 papers). Tribological Coatings/Surface Modifications. Mechanical properties on the atomic scale (1 paper). Superconducting Films. High Tc superconducting films (3 papers). Advances in Coating and Thin Film Characterization. Microstructure and buried interfaces (6 papers). Surface and thin film analysis methods (6 papers). Nondestructive characterization techniques (6 papers). Mechanical properties and film adhesion (5 papers). Advances in coating and thin film characterization (Poster Session) (2 papers). Optical Films and High Throughput Processing. Novel deposition processes (1 paper). Optical thin films (1 paper). Transparent conductive coatings (2 papers). Optical films and high throughput processing (poster session) (1 paper). Author index. Subject index.